A fever, a common ailment among toddlers, is generally a symptom of a viral or bacterial infection. According to The Doctors Book of Home Remedies for Children, a fever acts as a defense mechanism that helps the body to fight infection. If the fever causes irritability or crying, treat the fever with home remedies to help your child feel more comfortable. Remember that a child's temperature can fluctuate after high amounts of activity, being out in the sun or after a hot meal or drink. 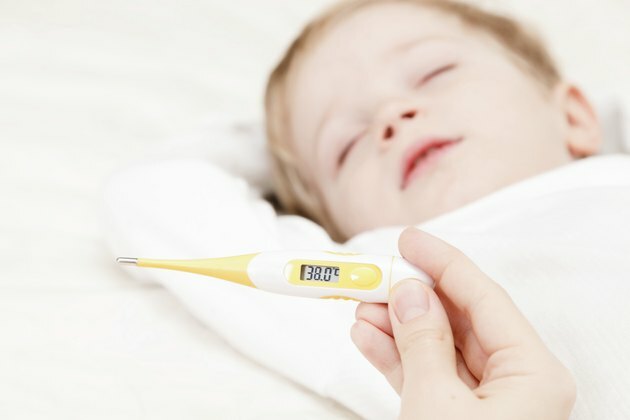 If your child's temperature is over 100.4 degrees, he has a fever. Contact a physician if your child is confused or delirious, has a stiff neck, has difficulty breathing or is inconsolable. For children under 2, use acetaminophen only if prescribed by a physician. The Doctors Book of Home Remedies for Children recommends a lukewarm sponge bath for children suffering from a fever. Fill the tub with tepid water and allow your child to sit in the bath for 10 to 15 minutes. Sponge the water over your child's body to provide a cooling effect. Ensure that the water is warm enough to avoid shivers. If your child gets the shivers, take him out and dry him off. Shivering raises the body's temperature, which defeats the purpose of the bath. Encourage your child to drink plenty of fluids, since fevers can lead to dehydration. If breastfeeding your toddler, continue to offer your child breast milk. Use an oral hydration solution for toddlers to replenish lost body fluids and electrolytes. According to the Mayo Clinic, oral hydration solutions include the proper amounts of salt, water and nutrients necessary for replacing essential body fluids. Give your child small, frequent sips of cool, not hot, beverages. Dress your child in lightweight clothing to avoid overheating, which may make the fever worse. Keep the room cool and cover him with a light blanket or sheet when sleeping or resting. Once used as a remedy for a feverish child, The Doctors Book of Home Remedies for Children discourages the use of alcohol to lower a fever. When rubbed on the skin it produces a soothing effect, however, rubbing alcohol causes shivering and may cause a toxic reaction when absorbed through the skin. Inhaling alcohol fumes can cause alcohol poisoning or irritation. Should You Drink Alcohol With a Cold?